After a hiatus in 2015, The Sundance Film Festival finally made its highly anticipated return to London. The decision was made to move the festival from its original venue at the O2 Centre in North Greenwich to the far more central location of The Picturehouse in Soho. This venue which is barely a year old has already seen huge popularity amongst film fans in and around London. On paper this should have been a great opportunity for the festival to pick up where it left off, and build on past successes, and in fairness it has somewhat succeeded in doing so. However, despite a great selection of films, it has failed to capture the imagination and for whatever reason some screenings had many unsold tickets left on the day. From my understanding the organisers are looking into making Picturehouse Central into a regular venue and are hoping to bring the festival back next year; if they bring a selection as strong as this year’s, one would hope that they will succeed in making the festival a successful one. However they will have their work cut out for them unless they can make the social side of the festival more accessible to festival-goers. This could be improved by adding live music and other social events to the proceedings. Having said that, it is encouraging to see that the organisers still believe in having the festival in London once again and that in itself is quite encouraging for the years to come. Opening the festival this year is Tallulah, the debut feature from Orange Is the New Black writer Sian Hedder. Hedder writes as well as directs this charming and very affecting tale, which is somewhat an unofficial Juno Reunion as it stars both Ellen Page and Allison Jenney. The film tells the story of Tallulah (Page), a Generation X drifter travelling across the States in an old van with her boyfriend Nico, surviving on whatever scams they can pull. However this hand-to-mouth existence finally starts to wear off on Nico, who suddenly declares that he dreams of going back home to New York, getting an apartment, and maybe even having a more conventional lifestyle with her. This doesn't go down well with Tallulah who is appalled by the thought of having to conform and be tied down to just one place. Tallulah wakes up the next day and finds that Nico has left her - and taken all their savings with him. Devastated and with no-one to run to, Tallulah shows up at Nico’s mother Margot’s (Jenney) apartment in New York asking for his whereabouts. Jenney’s brilliant depiction of a New York upper class intellectual, uppitty and stuck-up, is in wonderful contrast with Page’s formidable performance as an antisocial drifter. Things take a turn for the weird when Tallulah finds herself in charge of a baby girl - which she then decides to abduct, believing that the toddler’s mother, played by Tammy Blanchard, is incapable of looking after her. Blanchard’s performance as the alcoholic, pill-popping fallen woman, is both comedic and mesmerising; a kind of “Marilyn Monroe lost in the 21st century” who is left holding a baby she never wanted by a husband who no longer cares for her. Tallullah first and foremost tells the story of three very different women, who are brought together by fate, and who’s lives will be forever changed by this encounter. Hedder writes beautifully complicated characters who do not always behave how we want them to, and this is where her genius lies. There are also shades of supernatural running through the narrative, infused with magical realism and a hugely believable dialogue. 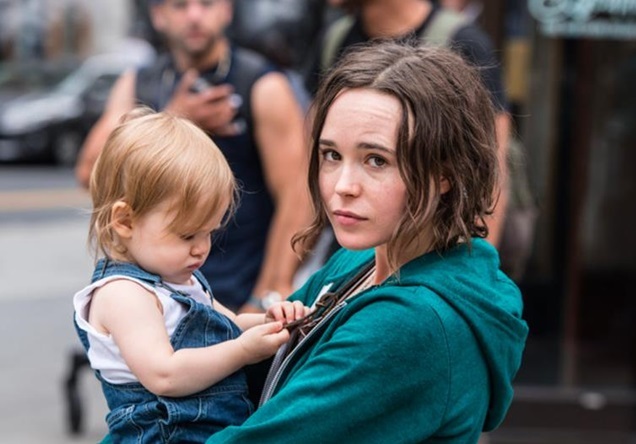 This makes Tallulah into one of the best first features to come out this year. Also in this year’s selection was Ordinary People, another debut feature, this time from Saturday Night Live comedy writer Chris Kelly. Kelly writes and directs this semi-biographical tale of terminal illness and family woes. Jesse Plemons (Breaking Bad, Friday Night Lights, Fargo) plays David, an openly gay 29 year old comedy writer, who moves back from New York to his childhood home in Sacramento to spend time with his ailing mother, played by Molly Shannon. The film falls into the increasingly familiar sub-genre of tragi-comedy, with abundance of laughter and tears in equal measure. The story is however at its best when allowed to unfold without forced hilarity or over the top laughter. Playing against type, Plemons’s depiction of David is both awe-inspiring and at times very touching. David is thrown into a whirlwind when his mother’s cancer is declared incurable. His relationship with his father Norman (The West Wing’s Bradley Whitford) is fraught as a result of him refusing to accept his son’s sexuality. David has to deal with not just tragedy and imminent loss, but also failure in his own life, as his TV pilot is passed over, and his five-year relationship with boyfriend Paul ends. Kelly manages to tell a story which is both touching and funny. Other People seeks to represent the horror of all-encompassing grief and succeeds in doing so. This can clearly be seen in some of the most touching scenes between Shannon and Plemons - there is a real sense of sadness, but also anger at the unfairness of what is about to happen. All in all, Other People is a refreshing take on the tragicomedy genre; however it stops short of fully convincing, and sometimes does not seem to know what it wants to be.